You have to wonder whether Vince Young knows what job he's applying for, or if he even realizes that he is "applying" for a job. The NFL doesn't recruit starting quarterbacks. It's not the Marines out looking for a few good men. When it comes to picking its quarterbacks, The League is Halle Berry on Oscar night. She can pick any designer she pleases, and the world's most renowned designers are just grateful for the opportunity to be considered. Vince Young doesn't get this. He thinks joining the NFL will be similar to joining the NCAA. He mistakenly believes he's holding all (or most of) the cards, and that come April's draft some lucky GM is going to feel like a lottery winner when Vince Young stands next to Paul Tagliabue and pulls on a Saints or Texans or Titans cap. 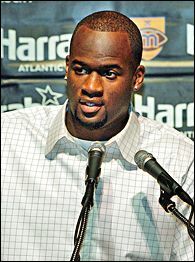 Vince Young is clueless. And I'm not talking about his score on the Wonderlic test. I'm talking about his understanding of what it takes to make it in the NFL as a quarterback. Humility is the No. 1 ingredient. The most prestigious and most difficult job in all of sports -- NFL quarterback -- is played at a high level by the men willing to humble themselves and prepare like each Sunday is a once-in-a-lifetime opportunity. This isn't the NBA, and Young isn't Shaquille O'Neal. You don't get the first half of the season to play your way into shape. It's not Major League Baseball, and Young isn't Roger Clemens. You don't get to stay at home with your family on certain road trips. This isn't the University of Texas, and Young is no longer able to rely on his superior athleticism and instincts to outduel his competitors. Young's success in the NFL will hinge almost exclusively on his willingness to prepare. And that's exactly what Young's Wonderlic score and other curious decisions call into question -- his will to prepare and his level of humility. The fact that Young had to take the Wonderlic twice in order to score a 16 is an indication to me that Young did not prepare for the test, particularly the first time. That speaks to Young's arrogance. So does his choice in representation and his decision to visit the president and the White House sans sports coat and tie. When you have a chance at being the No. 1 overall pick in the draft, securing a $25 million signing bonus and landing one of the 32 most important jobs in professional sports, you don't pick a family friend and local criminal defense attorney (Major Adams) to head up your campaign. That's not keeping it real. It's foolish and arrogant. It raises questions about your decision-making and maturity. Now, had Young wanted to give Major Adams a break, Young could've easily stipulated to any experienced potential agent that Adams work as co-counsel. A deal such as this would've provided Adams with a tremendous learning experience and protected Young's interest. It would've given Team Vince, the loosely formed management posse representing Young, some much-needed professionalism. A seasoned agent might be able to explain to Young the difference between being an NFL quarterback and an NBA small forward. Small forwards travel with posses decked out in white T's, bling bling and agents in sweat suits. NFL quarterbacks don't. When Young hit radio row at Super Bowl XL with posse and Major Adams in tow, that was the first time I sensed that Young might not grasp that the rules are different for QBs and DBs. When I learned that the leader of Young's posse (and the man calling the real shots for Team Vince) is a longtime friend and Houston nightclub owner who goes by the nickname "Black," that's when I told a friend to keep an eye on Young's draft stock. A starting NFL quarterback is the face of a billion-dollar corporation. He is one of the three or four highest-profile individuals in his city and perhaps in his state. His every move is cussed, discussed and analyzed by millions of people who don't have a clue about playing the position. It's impossible to exaggerate just how much more important the NFL is than every other sport in this country. 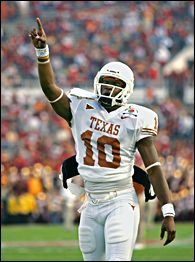 Vince Young foolishly thinks that the Texas Longhorns and Mack Brown are more important than the Houston Texans and Gary Kubiak. Young thinks playing USC for the national championship was real pressure. Playing quarterback in the NFL is the equivalent of getting in the sack with Jenna Jameson. Oh, everybody wants to do it, but it can be an incredibly humbling and "short" experience. Just ask Ryan Leaf or countless other can't-miss prospects. Michael Vick is in the process of getting humbled. He was supposed to reinvent the position. I don't believe the position will ever be reinvented. The guys who have consistent success will always be the guys who prepare the hardest. Before any NFL owner gives Young a bunch of guaranteed dollars, the general manager better make sure Young is going to hit the film room and practice field just as hard as Peyton Manning, Donovan McNabb and Tom Brady. The GM also should make sure that the head coach and offensive coordinator -- not some let's-hit-the-strip-clubs posse member -- have the ear of the quarterback. Playing QB in The League is a different animal. It's an honor. So far, Vince Young isn't treating it like an honor. He's treating it like it's his right, granted to him by an MVP performance in the Rose Bowl. You can be a fool and argue that Young proved all he needed to prove in Texas' upset of USC. Hmm. Didn't Redskins running back Tim Smith and Cowboys cornerback Larry Brown have big games on football's biggest stage and later prove to be frauds? And what don't people understand about the concept that NFL quarterbacks have to prove themselves week to week? Right now Young is proving that he doesn't have the necessary intangibles to thrive as a starting QB. He carries himself like a wide receiver. Jason Whitlock is a regular columnist for The Kansas City Star. His newspaper is celebrating his 10 years as a columnist with the publishing of Jason's first book, "Love Him, Hate Him: 10 Years of Sports, Passion and Kansas City." It's a collection of Jason's most memorable, thought-provoking and funny columns over the past decade. You can purchase the book at TheKansasCityStore.com. Jason can be reached by e-mail at ballstate68@aol.com. Sound off to Page 2 here.